If you're after a rustic, French-inspired cafe that serves more than crepes and coffee then Crepe Amelie will surely get the job done. The wood accentuated exterior with floor-to-ceiling paned glass windows lets in just the right amount of sunlight into the venue's simple interior. Grab a table outside and watch the loyal tribe of locals who return day in, day out for their daily coffee and flavorful meals. 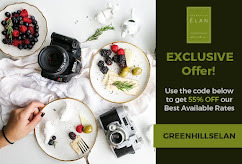 With the owners' and chef's passion in creating plates after plates worthy of every peso spent, you will sure to enjoy every food you will order. Why do I know this? Well, Crepe Amelie would not stand for more than five years if the community does not love them. Also, after having known that Chef Fham handles their kitchen already and is very much hands on, I don't have a cinch of doubt that the food will be very satisfying. 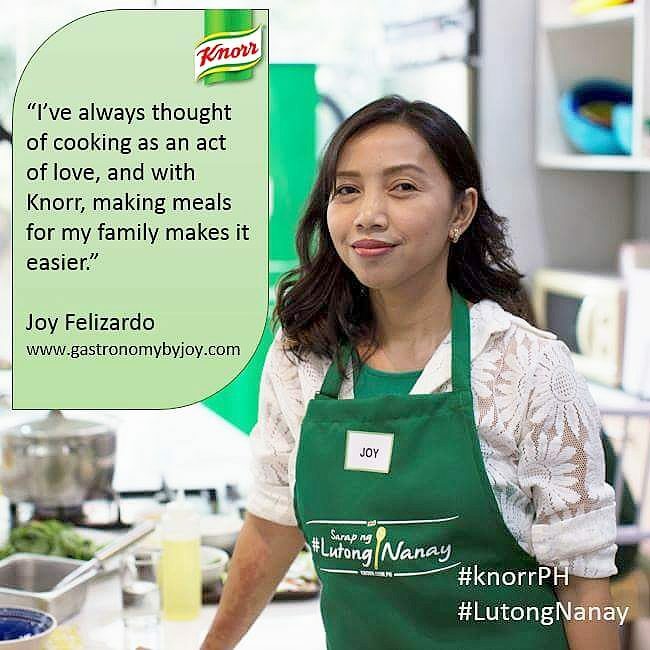 The memory of indulging with the dishes she used to make for her defunct resto in Tomas Morato, made me remember how well she executed the dishes in Flavours by Chef Fham. 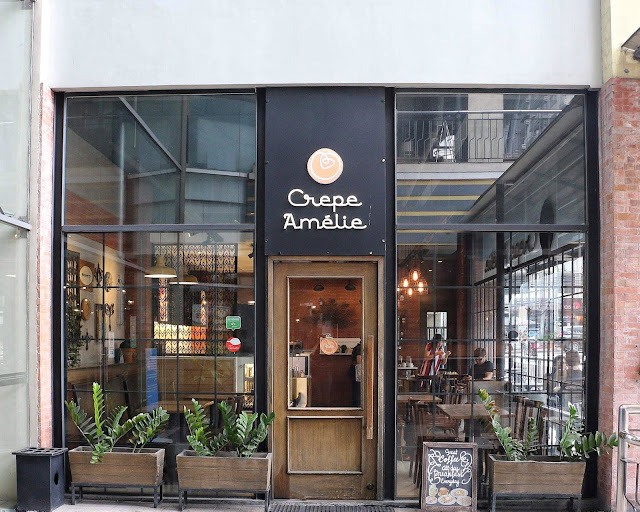 We have actually dined here at Crepe Amelie before, but it was when it was just new, and we only had coffee and of course crepe. 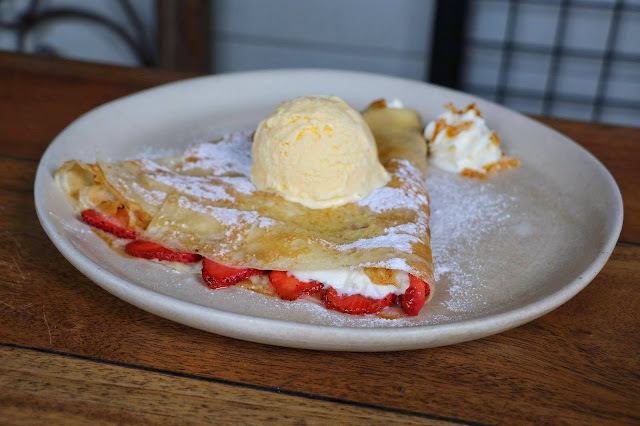 But upon investigating their not-so new menu, they have gone beyond authentic French savory and sweet crepes. Having said that, you might want to start with their cool drinks perfect for the coming hot days. Don't get too excited, this is not spiked, it just have mint leaves in it. It's a mix of freshly squeezed lemon and orange juice. Then there's the refreshing green juice as I remember it. 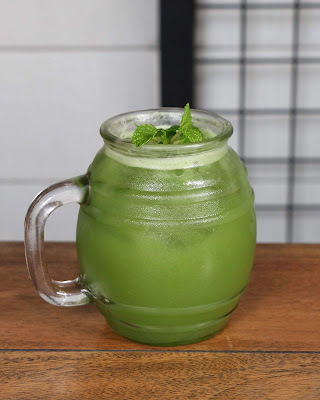 A concoction made with cucumber, apple and mint. I super love this!. Talking about note-worthy plates, waking up on this side of the city can be envious to many, including me, as their menu is equipped with breakfast of champions, all-day breakfast to top any others. Their addition to the menu, Breakfast Our Way. If this is their kind of breakfast, by all means, let me in! 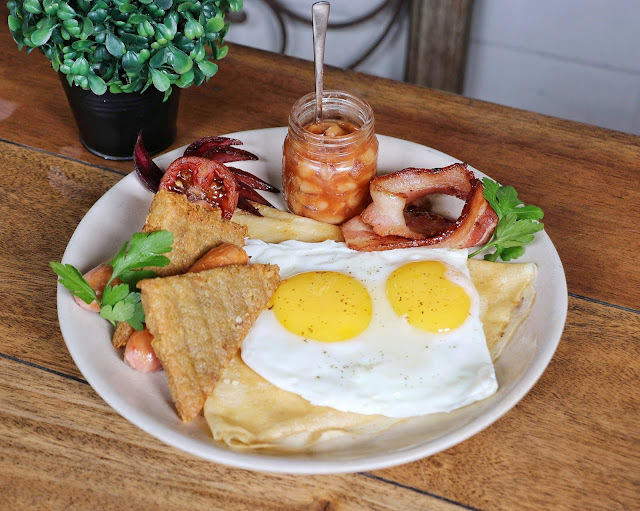 On the plate: plain savory crepe, topped with two fried eggs, hash browns (their own recipe), sausages, baked beans and bacon strips. For a French place, not having Croque Madame, it can be downright outrageous, so they invented Crepe Madame, a play on the previous classic. 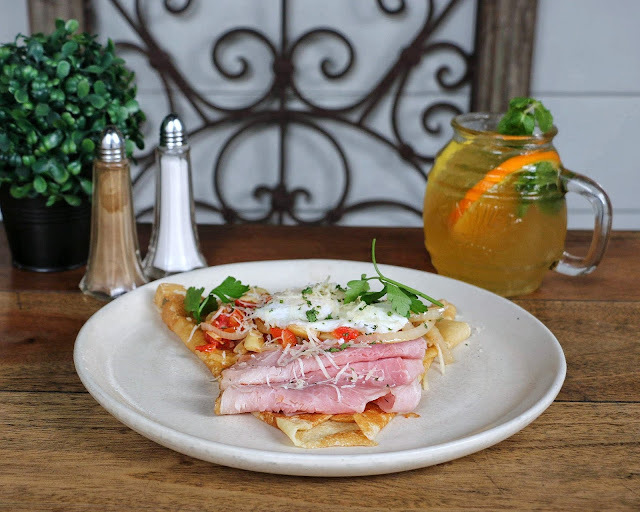 Their savory crepe is generously topped with ham slices, soft-fried eggs, tomatoes and Parmesan cheese gratings. I can't remember when I last cooked Pasta Puttanesca at home, and it was a delight to savor some here. 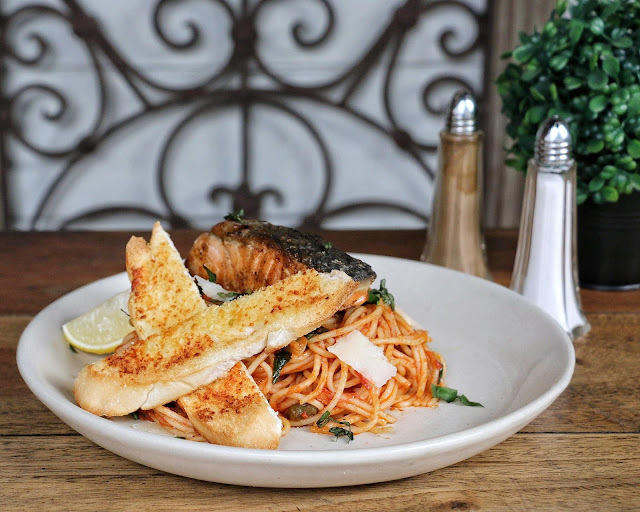 What's even more delightful is the hefty serving of grilled salmon and shavings of Parmesan cheese. Want to cook Salmon Puttanesca? Get the recipe here. If you're thinking of a more innovative take on French classics, don't be so surprised as they have it too. 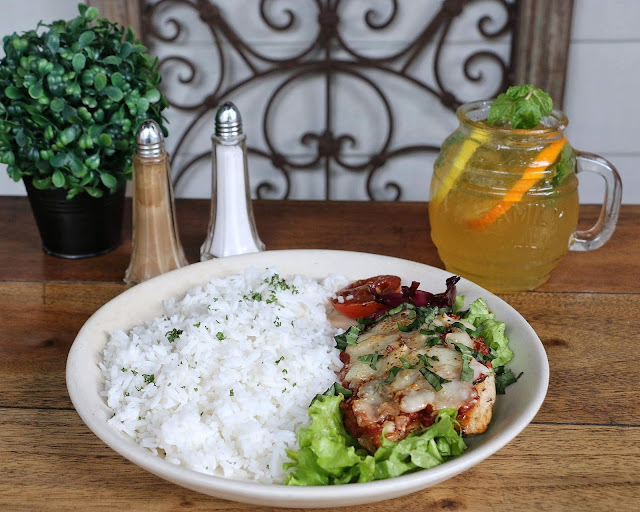 Their Chicken Parmigiana is actually a fusion between classical Chicken Parmigiana and Ratatouille (pronounced as RAT-ə-TOO-ee). 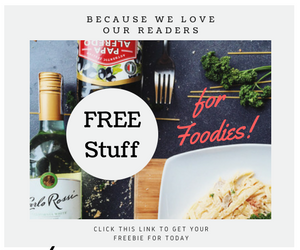 Don't be intimidated yet as they are just as yum as the classics. Instead of just tomato sauce to lather the breaded chicken with, Chef Fham used Ratatouille, and it livened the flavor of the chicken more, making you have more rice as you bite. For dessert, and yes, I saved the best for last, the ultimate crowd-pleaser, Strawberries and Creme. 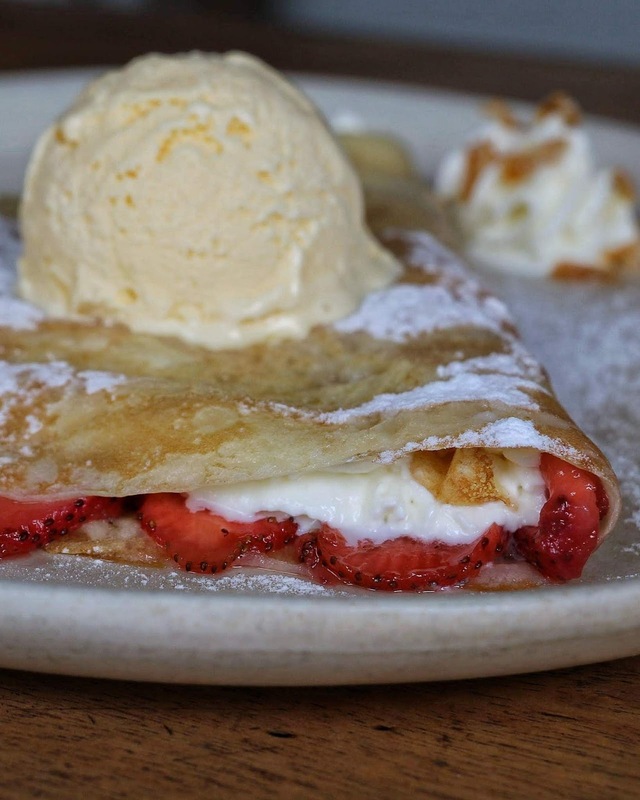 Have I mentioned that they use to kinds of crepes, one recipe for the savory and a different one for the dessert. That's just fair, isn't it, as we don't like to confuse our palate with hints of sweetness. Well, this one is sweet, definitely, but not too much. Just right to hit away the "umay" from the savory ones. I love the juicy and crunchy bite to the strawberries mixing with the cream inside and the ice cream on top, with the crepe just cuts in between so nicely, and how can I forget about the side crema embellished with candied orange peel, makes all the difference as it adds more spiciness and a whole level of texture and flavor to the crepe. 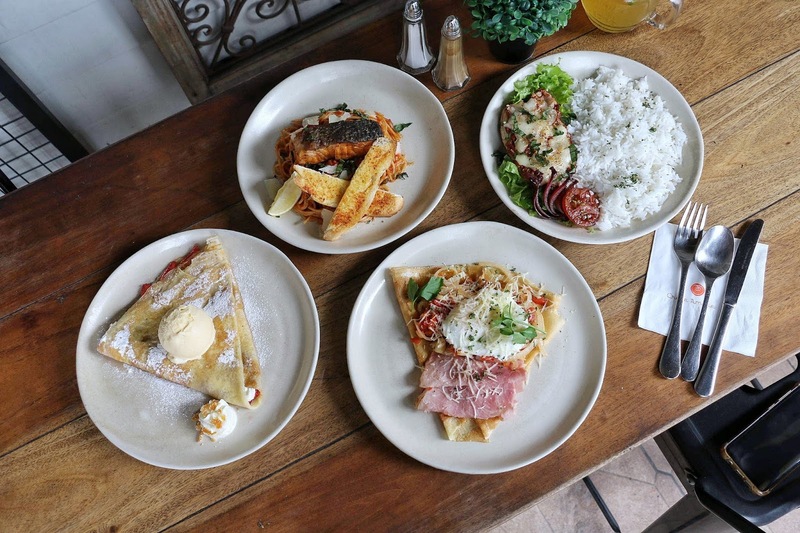 If you want to spoil someone pretty, especially this Valentines season, I suggest you bring him or her (but make sure you have flowers) at Crepe Amelie. 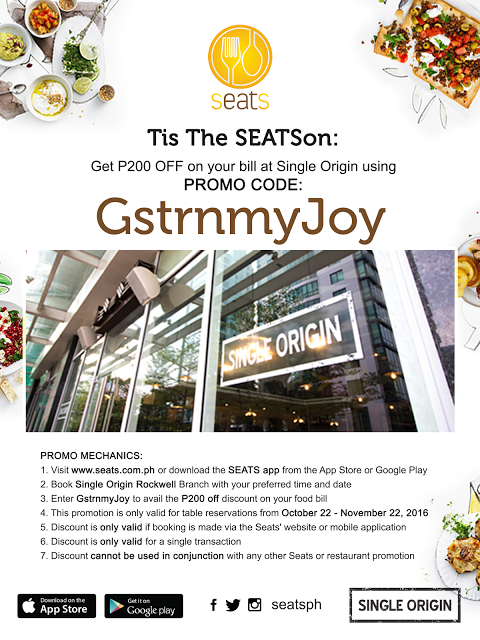 Everything is good for sharing as the serving is quite hefty, you spend a little above P 500 and it'll all be totally memorable. 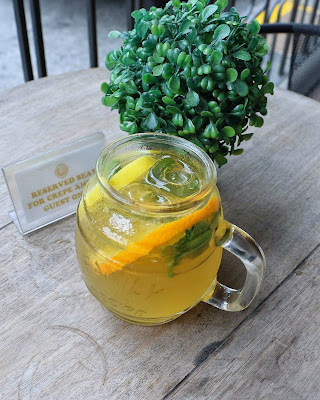 They now have two branches, my husband and I tried their first branch at A.Venue Mall, the other one is located at Antel 2000, Salcedo Village.